Setting the hook shouldn’t create any slack line. Don’t keep your rod tip too high, it should be closer to the water level than at perpendicular to it. When you get a hit, strike and set the hook. Don’t set again, just keep reeling. If you’re going to pump the fish, take short strokes. Keep testing your hooks for sharpness, today’s chemically sharpened hook are good to go out of the box. They’re tough to sharpen, but can be touched up if not too dull. I’d just replace them if they can’t get a good point.. I had the cat converter stolen off my early 90’s Tacoma about ten years ago. The dealer cost to replace it was well over a grand then. I bought an aftermarket converter for about $200 and installed myself. The thief made a clean cut that I was able join to the new part somehow without welding. Sorry I don’t remember the details. When and where is the show this year? I’m always amazed at the knowledge on this forum. They seemed like such an odd design that I was afraid they might have been a novelty. Any idea of their value. I’m assuming they were made in the 50’s. Had these on the wall a while. I don’t know the origin or anything about them. The hooks are wishbone type that ate used on offshore lures. One lure has SS hooks, the other looks plated. They are mounted on a pin running through the plug. They also are held close to the plug body on another pin. I assume that when a fish is hooked the hook swings freely. Whoever made them was thinking outside the box. WHAT WAS YOUR FIRST PAIR OF WADER OR HIP BOOT? Red Ball waders from Paragon's in Manhattan. Thinking then was that the thicker the rubber, the better the wader. I’ve had an 06, 09 and now have a 2013 4Runner. Wish I kept the 09. The 5th gen has some nice bells and whistles such as blue tooth and a back up camera. The 09 got 10-15%better gas mileage and had some nice standard features such as running boards, climate control and rear storage shelf. It was a bit smaller but felt more homey. I still look at the ads for a gen 4 and may go back if the right one comes up. I have an early Pichney from around 1984, it’s the black/ silver one. I think the all black one is a later Pichney but I’m not sure. It has 4 belly weights. The paint job looks like too much Liberace to be Danny’s. Here’s a few more pics. The hook points are covered in plastic tubing, the he package them that way? Can you tell if this is a Habs? What should I look for? I was still in my old shop when this was given to me, we moved outta there in 2002. It was in my possession prior to that, probably at least several years prior if that helps. It was not given to me by Habs, but a customer. Would appreciate any guidance. Roy, thanks for the photo and info. Does anyone know if they cast or trolled these. 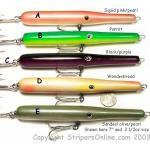 Salmon plugs were popular for bass trolling around Cuttyhunk. Could he have made that plug with stripers in mind? Tim, we had a 3’ needle hanging but someone other than Habs made it. Albie Snax are a misnomer. Caught a lot more bass on em than albies. Very effective when bass are finicky on sand eels and spearing. I sold my tackle shop 5 years ago and I’m in the process of valuing some of the old plugs that decorated the place. Someone gave me this plug about 15 years ago, I think it’s called a Hab n egg. Is my ID correct and was this used as a lure or was it more of a novelty? Any idea of of its value. I’m not sure if it’s ok to ask values on this forum, if not I apologize.